D & B Wholesale Rubber products are manufactured in Malaysia, the home and original source of natural rubber. Malaysia is the world’s leading producer of natural rubber and this plentiful resource is available at a reasonable price. 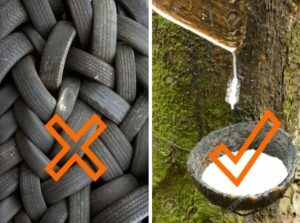 Taiwan produces almost no natural rubber but has a considerable business in producing RECONSTITUTED rubber, a product made by shredding and grinding discarded tyres and other vulcanised rubber goods. This shredded dust is desulphurised by washing in sulphur elimination chambers, and it is the dust that is remilled as reconstituted rubber. Unfortunately during the grinding and shredding process, the long chained rubber molecules are broken down. This breakdown is NOT reversible or repaired during remilling, and thus reconstituted rubber does not have the resilience, tensile strength, or elasticity of pure natural rubber, nor is it as resistant to abrasion, to tearing and to impact. These special properties of virgin natural rubber make D & B Wholesale brand products superior, and at little or no extra cost. Reconstituted rubber products are hard to the feel and are easily torn or damaged, often prior to installation, or with little use. With confidence we GUARANTEE the purity and performance of our D & B Wholesale rubber products.